Easter’s on, which means candy galore, costly church dresses, and loads of money for an exotic dinner at the plush, local restaurant. Well, if you play it right, and act with a little smartness, your Easter bill can be so affordable you could celebrate it EVERY Sunday without breaking your bank. If you’ve bought your chocolate bunnies and other Easter goodies weeks ahead of time, then its very likely that you’ve paid too much. Instead, you should buy your Easter goodies as close to the actual holiday as possible, maybe even the night before. This means you’ll pay a lot less. Basically, stores look for opportunities to get rid of their old stocks and make room for fresh ones like garments, decorations, etc. And then there are many retailers who’ll cut down prices anywhere from 50-90% to accomplish their objectives. Which offer sounds better: a large chocolate bunny for five bucks or one for 85 cents? Why should you waste gas by driving to some Easter egg hunt in the park? Rather, you can just do the same easily in your own home! All you’d need to do is, hide the eggs all over the place and when the kids show up first in the morning, throw a challenge them asking to find all the eggs. The winners gets the biggest piece of rabbit. However, just remember where you’ve put all the eggs, in case you are using real ones. Actually, the last thing you’d expect in the world is a house full of rotten egg smell. Be smart enough to put under the loveseat, so that they can be easily located. The cost of egg dying kits charged by the Paas these days is too much. But, don’t worry. We’ve got you covered and you can make your own dye. For all intents and purposes, it’s free. You can simply make use of few drops of food coloring (if required, then you can buy a package of several colors included for a couple of dollars), boiling water, and a teaspoon of vinegar. 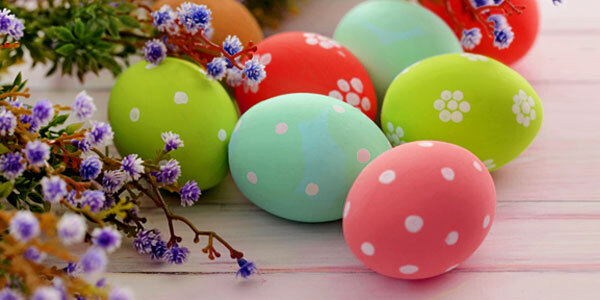 Mix the colors well, and you’ll get 100% user-friendly egg dye at virtually for free. And if you run short of colors and need more, then you can simply make more, also for free! There are millions of entertainers out there in the world. These people will gladly dress up as the Easter Bunny for your child’s Easter party – at a cost, for obvious reasons. Usually, this amount is a rather costly one. There is no need to hire any of these so-called paid entertainers, even if they’re the best at hopping. Either you may create your own Easter Bunny costume, or find a boutique or shop where the children can get pictures for free with the Rabbit, or you may just sit back and fire up some old Bugs Bunny cartoons for an afternoon. Though it may sound as blasphemous, yet there is such a thing as excessive chocolate, particularly when that chocolate can run you a pretty penny. If you purchase a couple of chocolate bunnies at five bucks per piece, then that’s $70 on chocolate bunnies alone. That’s way too much candy for any family (ideally kids should just have a some small pieces each, holiday or no,) and save that money for more important matters, like bills or ingredients for a delicious, homemade Easter delicacy. Any restaurant that ranks higher up on the food chain as compared to McDonald’s will have an Easter dinner ready for you to relish and enjoy with your family. Of course, it’ll cost you some extra bucks. On the basis of your family size, you could easily reduce $50-100 on one night’s meal.. What’s the point, when you can just as easily create your own delicacies for the Easter at home? Buy the groceries you want, cook it on your own terms, garnish it with whatever sides suits you, and serve it with a dessert that’s has to be way better (and of course cheaper) than whatever the local restaurant would stir-up.